Design a clean flat logo for a [login to view URL], with and without .com in flat color/use maximum of 2 flat colors. 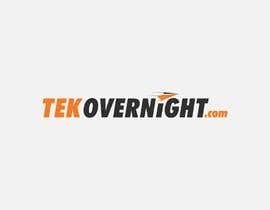 TEK stands for technology and overnight stand for fast shipping. don't make a busy looking logo its need to be clean and meaningful. working on it... please don't close it before..
everybody rejected so he is a good designer. nice man ,what do u want? Original idea and design. Please feedback. I hope you like my Design.Let me Know if you want any change. Color+Font would be change as per your request. I will give you all the editable files of this logo e.g, Ai, PSD, PDF, EPS.I will give PNG file with 300ppi transparent background. Any feedback will be appreciated.please contact me via message thanks. Contest Owner, please rate the entries. Owners use 3 stars for designs they like but aren't complete just yet.